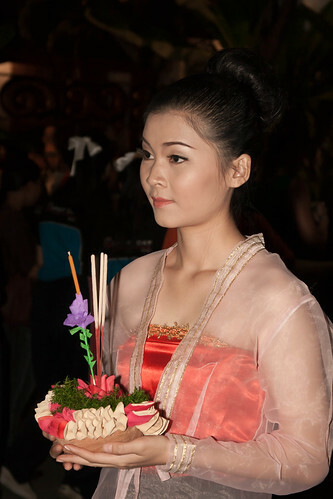 Loy Krathong is a traditional lunar festival marks the end of the rainy season. The Thai tradition of Loy Krathong began in the ancient capital of Sukhothai and is now celebrated throughout Thailand. Parades and beauty contests are part of the fun. People release paper lanters into the sky and float decorated banana-leaf boats (krathongs) onto ponds, lakes and rivers on the full moon of the 12th month in the traditional Thai lunar calendar, honoring the Goddess of Water. This work is licensed under a &lt;a href=&quot;http://creativecommons.org/licenses/by-nc-sa/3.0/&quot; rel=&quot;nofollow&quot;&gt;Creative Commons Attribution-NonCommercial-ShareAlike 3.0 Unported License&lt;/a&gt;. &lt;b&gt;Attribution&lt;/b&gt; — You must attribute the work in the manner specified by the author or licensor (but not in any way that suggests that they endorse you or your use of the work). &lt;b&gt;Noncommercial&lt;/b&gt; — You may not use this work for commercial purposes. &lt;b&gt;Share Alike&lt;/b&gt; — If you alter, transform, or build upon this work, you may distribute the resulting work only under the same or similar license to this one.